Explore the Tower of London with AESU! 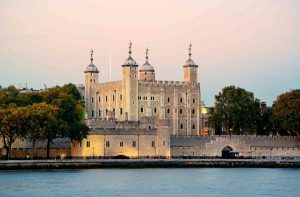 The Tower of London was built approximately 900 years ago and has since filled its halls with pieces of English history including infamous prisoners, the crown jewels, a royal zoo, and six superstitious ravens. This week we’re taking a closer look at the historic castle, officially known as Her Majesty’s Royal Palace and Fortress of the Tower of London. Let’s explore. The first Norman King of England created the first fortifications after the conquest of London in 1066 A.D. He was responsible for the White Tower, which gained its named after the exterior was whitewashed in the 13th century by King Henry III. The Tower continued to expand for about 250 years after William the Conqueror’s death. Now, the Tower of London features a complex series of buildings and fortifications that take over 12 acres of land. The Tower of London is famous for housing the crown jewels, including the crowns worn by the monarch at the coronation and the opening of Parliament. Royals began hoarding their jewels in the vaults of the Tower as early as 1303 when a number of treasures were stolen from the Abbey of St. Peter at Westminster. The oldest piece of surviving Regalia is a 12th-century gold Anointing Spoon, used to anoint the Sovereign with holy oil. All other pieces were destroyed in the mid-17th century, but the Tower of London has managed to keep this last piece of history alive. At least six ravens are kept at the Tower at all times, under the care of the Yeomen Warders. It is believed that if the ravens are absent, the Tower will fall. The current raven master, Chris Skaife, has been testing a new method of clipping the ravens’ wings which allows for one loyal bird to leave the tower completely. This may be the first time a raven master has allowed a raven to leave the Tower in over a century. This entry was posted on Wednesday, May 17th, 2017	at 4:57 pm	. You can follow any responses to this entry through the RSS 2.0	feed. Both comments and pings are currently closed.